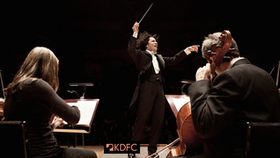 Conductor Gustavo Dudamel's passionate music-making continues to inspire audiences of all ages worldwide. Currently serving as Music Director of both the Simón Bolívar Symphony Orchestra of Venezuela and the Los Angeles Philharmonic, the impact of his musical leadership is felt on four continents. While his commitment to these posts accounts for the major portion of his yearly schedule, Dudamel also guest conducts with some of the world's greatest musical institutions. This season he returns to the Vienna and Berlin Philharmonics, and tours with La Scala in opera and concert to Japan. Additional guest appearances include the New York Philharmonic, Munich Philharmonic, Philharmonia Orchestra London, Bamberg Symphony, Bavarian Radio Symphony Orchestra, and Gothenburg Symphony, where he is Honorary Conductor. Gustavo Dudamel is in his fifth season as Music Director of the Los Angeles Philharmonic, where his contract has already been extended through 2018-19, the orchestra's 100th season. Under his leadership the Los Angeles Philharmonic has expanded its diversified outreach through many projects, most notably Youth Orchestra Los Angeles (YOLA), influenced by Venezuela's widely successful El Sistema. With YOLA, Gustavo brings music to children in the underserved communities of Los Angeles, and also serves as an inspiration for similar efforts throughout the United States, as well as for programs in Sweden (Hammarkullen) and Scotland (Raploch). This season, the students of YOLA will have the unique opportunity of playing alongside the musicians of the Los Angeles Philharmonic in its first ever public "side by side" concert. 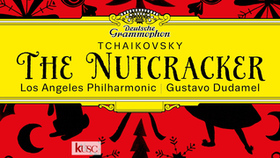 An exclusive Deutsche Grammophon artist since 2005, Grammy winner Gustavo Dudamel has numerous recordings on the label. As part of a major Mahler recording project, his most recent CD release is Mahler 9 with the Los Angeles Philharmonic, with Mahler 7 (Simón Bolívar Symphony Orchestra) anticipated for early 2014. In addition, DG has already released Mahler 5, as well as Dudamel: Mahler 8 - Symphony of a Thousand Live from Caracas (DVD + Blu-Ray), featuring the combined forces of the LA Phil and the Bolívars. September 2013 sees the international release of an all-Strauss disc with the Berlin Philharmonic (CD), and a concerto disc with the Bolívars and Yuja Wang featuring Rachmaninoff's Third Piano Concerto and Prokofiev's Second Piano Concerto is scheduled for release later this season. A CD of Adams' Gospel According to the Other Mary with the Los Angeles Philharmonic is planned for release in March 2014. 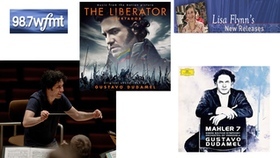 Many video/DVD releases capture the excitement of important concerts in Gustavo Dudamel's musical life, including The Inaugural Concert documenting his first concert in 2009 as Music Director of the Los Angeles Philharmonic, New Year's Eve Concert Gala 2011 with the Berlin Philharmonic, and a Birthday Concert for Pope Benedict XVI, among others. 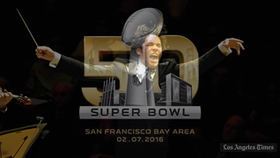 In June 2011, a documentary, Let the Children Play, featuring Dudamel, was shown in over 500 Fathom movie theaters nationwide. 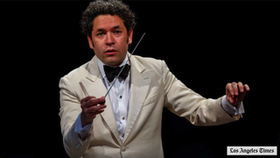 Gustavo Dudamel has been featured three times on CBS's 60 Minutes and appeared on a 2010 PBS special, Dudamel: Conducting a Life, with Tavis Smiley. He appeared onSesame Street with Elmo in February 2012. 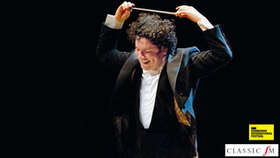 Gustavo Dudamel is one of the most decorated conductors of his generation. He has recently been named Musical America's 2013 Musician of the Year, one of the highest honors in the classical music industry, and was voted into the Gramophone Hall of Fame. In October of 2011, he was named Gramophone Artist of the Year, and in May of the same year, was inducted into the Royal Swedish Academy of Music in consideration of his "eminent merits in the musical art." 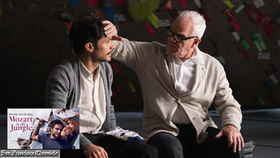 The previous year, he received the Eugene McDermott Award in the Arts at MIT. 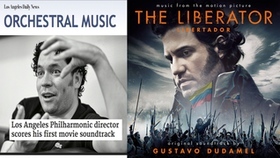 Dudamel was inducted into l'Ordre des Arts et des Lettres as a Chevalier in Paris in 2009, and received an honorary doctorate from the Universidad Centroccidental Lisandro Alvarado in his hometown of Barquisimeto. He also received an honorary doctorate from the University of Gothenburg in 2012. 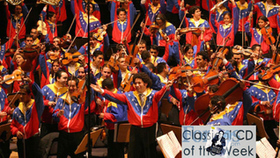 In 2008, the Simón Bolívar Youth Orchestra was awarded Spain's prestigious annual Prince of Asturias Award for the Arts and, along with his mentor José Antonio Abreu, Dudamel was given the "Q Prize" from Harvard University for extraordinary service to children. Named one of Time Magazine's 100 most influential people in 2009, Gustavo Dudamel was born in 1981 in Barquisimeto, Venezuela. He began violin lessons as a child with José Luis Jiménez and Francisco Díaz at the Jacinto Lara Conservatory. He continued his violin studies with Rubén Cova and José Francisco del Castillo at the Latin American Academy of Violin. His conducting studies began in 1996 with Rodolfo Saglimbeni and, that same year, he was given his first conducting position, Music Director of the Amadeus Chamber Orchestra. 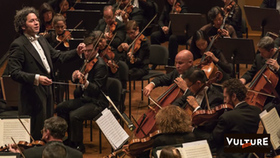 In 1999, he was appointed Music Director of the Simón Bolívar Youth Orchestra and began conducting studies with the orchestra's founder, Dr. Abreu; a few years later, in 2004, Dudamel was brought to international attention by winning the inaugural Bamberger Symphoniker Gustav Mahler Competition. These early musical and mentoring experiences molded his commitment to music as an engine for social change – a lifelong passion. In 2012, Gustavo and Eloísa Dudamel launched The Dudamel Foundation, which is dedicated to furthering music education and social justice around the world. 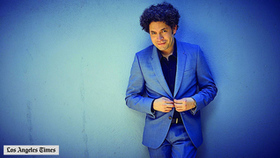 Gustavo Dudamel, his wife Eloísa Maturén, and their young son Martín divide their time mainly between Caracas and Los Angeles. Berliner Philharmoniker - In a city of rich cultural and artistic history, the Berlin Philharmonic Orchestra is one of Berlin's three excellent orchestras. A democratic, self-governing organization, members choose the resident conductor, orchestra manager and new orchestra members (after a one-year probation) by vote of the membership at large. Members with 10 years' seniority are eligible for pension benefits. Performing approximately 100 concerts a year, the Berlin Philharmonic tours internationally and generates most of its operating capital through ticket sales and revenue from its extensive broadcasting and recording contracts. Several significant ensembles including the Brandis and Westphalian string quartets, the Philharmonic Octet, and the Twelve Philharmonic Cellists are made up from the Berlin Philharmonic's 114 members, internationally acclaimed for their polished performances and high standards of musicianship. Founded in 1862 by Benjamin Bilse under the name Bilsesche Kapelle (Bilse's Band), the original 60-member ensemble gained popularity. It was renamed and reorganized under the financial management of Hermann Wolff in 1882. Hans von Bülow set the ensemble on its course of artistic excellence, beginning as principal conductor in 1887. 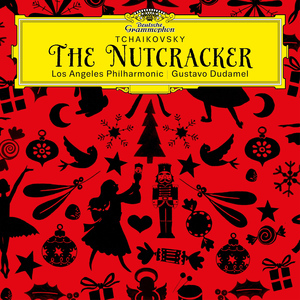 He insisted on the highest musical standards, attracted world-renowned guest conductors such as Tchaikovsky, Brahms, and Strauss, and supervised the renovation of the orchestra's home venue, a converted roller skating rink. Due to ill health, von Bülow resigned his position in 1892. The Philharmonic played at his funeral ceremony in February 1894. Over the next several years, Wolff engaged a series of popular guest conductors including Hans Richter and Richard Strauss. Then in 1895, Hungarian-born Arthur Nikisch was chosen as resident conductor and led the Berlin Philharmonic to its well-earned reputation as the most respected touring orchestra in Europe. He brought out the lyrical qualities for which this ensemble became famous. Soon after Nikisch's death in 1922, the reins of leadership were given to Berliner Wilhelm Furtwängler. Over the next two decades, Furtwängler debuted works by the likes of Debussy, Stravinsky, Prokofiev, and Schoenberg. Important soloists were a regular feature during this period and included such luminaries as Paul Hindemith and Yehudi Menuhin. Difficult economic times came after the worldwide financial crash in 1929 but the ensemble was able to survive through subsidies from the city of Berlin, the German government, and the Berlin Radio Network. Further hardship came when its home venue was destroyed by a bomb in January 1944. Performing in borrowed spaces, the orchestra continued even after the beloved Furtwängler was detained during the political vindication proceedings which took place after Hitler's fall in 1945. Leo Borchard was named resident conductor in May 1945, but was shot and killed by an Occupation soldier three months later. Sergiu Celibidache was chosen to follow Borchard and was widely acclaimed for his inclusion of contemporary repertoire, much of which had been banned during Hitler's reign. When Furtwängler was finally released in 1947, he and Celibidache shared the Berlin Philharmonic's podium until Furtwängler's death in 1954. The members of the Philharmonic chose Herbert von Karajan as resident conductor in 1955. Under his leadership, the orchestra gained worldwide recognition. The Philharmonic began construction of a new concert hall in 1963. Designed by architect Hans Scharoun, the orchestra's home venue near Berlin's Brandenburg Gate seats 2,000 audience members and contains an impressive Schuke organ. Von Karajan also began the orchestra's tradition of committing five performances each season to twentieth century music. Late in that 1989, following Von Karajan's death, Claudio Abbado was chosen to continue the Berlin Philharmonic's tradition of musical excellence and polished performance and lead this world-renowned orchestra into the 21st century. He was succeeded in 2002 by Sir Simon Rattle. It's nearly noon on a Saturday. A blazing sun bears down on the Hollywood Bowl, whose 18,000 seats are unoccupied at the moment. But onstage Gustavo Dudamel, the Venezuelan-born conductor of the Los Angeles Philharmonic, is leading a vigorous rehearsal. The musicians, shaded by the venue's shell, are all in casual dress. Dudamel is sporting a black polo shirt, jeans and what look like blue suede shoes. Otherwise he remains a study in sheer concentration, precisely cueing various groups of musicians throughout the rehearsal, and giving them feedback on the sound. He will open his sixth season as the Philharmonic's musical director on Sept. 30, an event that makes it hard to believe this conductor is only 33. 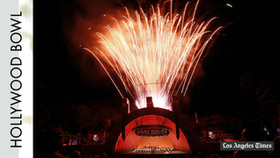 A world-class artist who has become synonymous with classical music in Southern California and who tours the world, Dudamel displayed a new facet of his talent in a July 31 concert at the Hollywood Bowl, leading the orchestra in a suite from the film score he recently composed, his first. While cooling off backstage after the rehearsal, Dudamel explains how this new shift in his career happened. 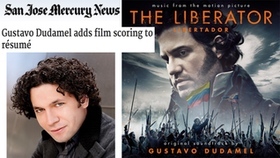 In light of his commitments with the Philharmonic and two other major orchestras, Dudamel says he intended to be just a musical adviser on The Liberator, a film directed by his friend Alberto Arvelo and starring his friend Édgar Ramírez. Both are fellow Venezuelans, and the movie was inspired by the life of Símon Bolívar, the military genius who helped free not only their country but Bolivia, Panama, Colombia, Ecuador and Peru from Spanish rule early in the 19th century. READ THE FULL San Jose Mercury News INTERVIEW.